Providing you the best range of sinter bronze brass threaded silencer with effective & timely delivery. We are a paramount organization that is engaged in manufacturing, supplying and trading superior quality Brass Threaded Silencer. The range made available by us is manufactured keeping in mind the variegated requirements of our esteemed customers. To manufacture these silencers, we make use of high quality material that is sourced from reliable vendors of the market. 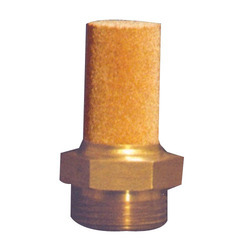 Looking for Brass Threaded Silencer ?